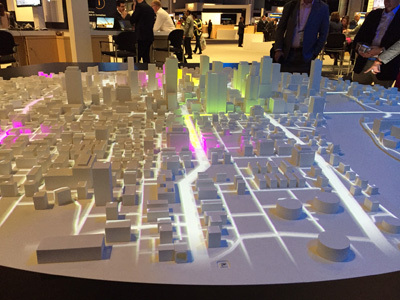 When I first spotted the luminescent white Smart Cities model (at right) on the show floor at the recent SAPPHIRE NOW & ASUG Conference, I couldn’t get near enough to take a photo given the crush of experts around it from not only city planning, but also renewable energy providers, chemical companies, manufacturing suppliers and others. Dante Ricci, Public Sector Industry Marketing at SAP, stepped away from the throng to talk about how cities are ideal proving grounds for innovations that have a cascading effect across industries like automotive, public transportation, utilities, insurance, engineering and construction. The model demonstrated how SAP Leonardo innovations powered three scenarios in personal mobility, crisis prevention and infrastructure featuring autonomous cars, the airport of the future, and flood control. Ricci saw some of the strongest initial opportunities in disaster and emergency management. Machine learning can help communities deal with disasters by taking precautions, responding faster to head off worse problems, and delivering assistance where it’s needed most. The model showed how sensors along a river that ran through a city combined real-time data from images on water levels in tunnels and storm drains with weather forecasts to help public works and emergency management crews monitor situations. Machine learning and blockchain are among the top customer interests with an endless list of use cases. Travelers can enjoy clog-free roads when autonomous cars pick up passengers at the airport. Fans can get closer to their favorite sports teams whether they’re cheering in-person at games or virtually. City planners can reduce traffic immediately and make smarter decisions to address trouble spots over time. They can alter urban landscapes as autonomous cars increase, repurposing parking lots into green space. Meantime, Ricci said SAP already is working with cities in Italy providing sensors in storm drains, as well as smart lightposts to measure air quality and traffic flow. “We’ve taken the guesswork out of scenarios that decision-makers in communities and companies are worried about, whether it’s risk aversion, money loss due to the weather and other unexpected elements and economic factors. If you have the data to get ahead of problems, you’re truly digital so you can innovate and stay agile, and be more effective as a business or government,” said Ricci.